AWAREFramework-iOS is a library version of AWARE iOS. The library allows us to easily implement functions (e.g., background sensing, database synchronization, and ESM) which are used on AWARE iOS, into your standalone application. 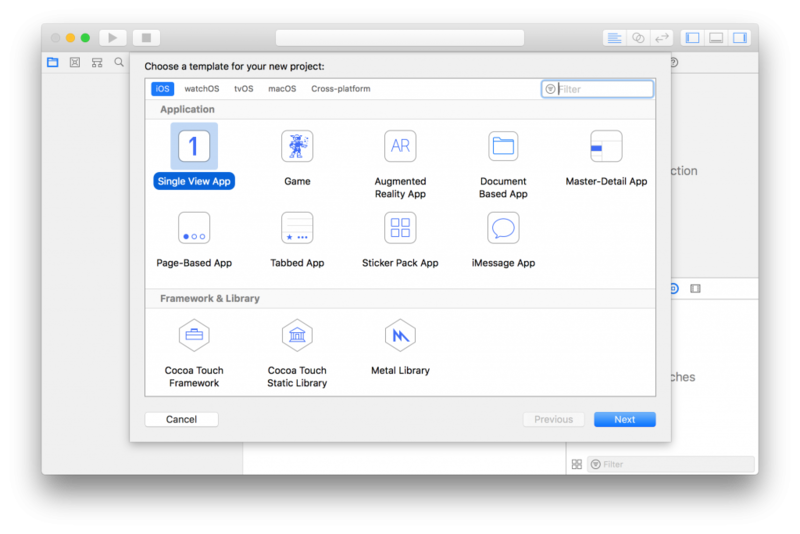 This tutorial shows how to create a standalone iOS application with AWAREFramework-iOS. The library can be installed via CocoaPods to your Xcode project and easily extend/adjust to your project. Open Xcode and select Menu -> File -> Project... -> Application for creating a new project. AWAREFramework-iOS can be installed via CocoaPod which is a well-known library manager for Xcode. If CocoaPod is not ready on your PC, please install it on your computer via their website (link). For installing the library vai CocoaPod, please move to the created project using Terminal or related software. At the directory, run the following command to set CocoaPod into your project. After running the command, Podfile and project_name.xcworkspace are generated into your project. The Podfile manages libraries for your project. For installing the library to your project, you need to add library information to the file using Text Editor. After Podfile is ready, you should run the following command to installing the library. NOTE: the following permissions are minimum requirements for background activity sensing. Please change this setting based on your required sensors. First of all, please activate AWARECore, and also, if you need to collect sensor data in the background, please request a permission for background sensing. // OPTION: please request the following permission if you need to collect sensor data in the background. Just the following code, your application can collect sensor data in the background. The data is saved in a local storage. AWARECore, AWAREStudy, and AWARESensorManager are singleton instances for managing sensing/synchronization schedule in the library. You can access the instances via AWAREDelegate. The AWAREDelegate is described in the Installation section. AWAREFramework-iOS allows us to synchronize your application and AWARE server by adding a server URL to AWAREStudy. About AWARE server, please check our website. Moreover, this library allows us to apply the settings on AWARE Dashboard by using -joinStuyWithURL:completion method. This library supports ESM. The ESM function allows us to make surveys on your app easily. The following source code shows an example of the survey which is composed of a radio button and delivered at 9:00, 12:00, 18:00, and 21:00 every day. ESMItem * radio = [[ESMItem alloc] initAsRadioESMWithTrigger:@"1_radio"
Please call the following chunk of code for appearing ESMScrollViewController (e.g., at -viewDidAppear: ).